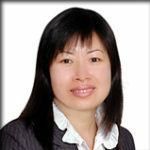 Dr Pham Thi Kim Dung, an animal geneticist from the National Institute of Animal Husbandry Chem-Tu Liem-Hanoi, Vietnam was awarded the 2007 ATSE Crawford Fund Fellowship. Dr Dung took up her Fellowship in February at the Animal Genetics and Breeding Unit, a joint venture of the Department of Primary Industries, NSW and The University of New England, Armidale. Whilst there she received training under the mentorship of Dr Suzanne Hernesch and colleagues in strategies to improve the pig breeding programs in Vietnam. Given that Vietnam has the largest pig herd in Southeast Asia and they are of great significance because of their contribution to human nutrition, their role in agriculture and their contribution to incomes, we are confident that she has contributed much after her return to Vietnam.